Animal Pak By Universal Nutrition at SameDaySupplements.com® for lowest price. You train hard to get the physique you desire so it only makes sense to put in your body stuff that works. 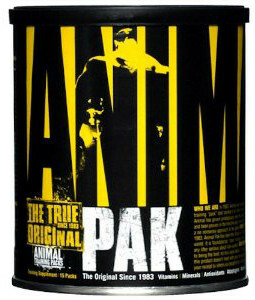 universal Nutrition Animal Pak has been a staple in men, women, of all physiques and training styles for over 25 years. That's because Animal Pak works. Providing your body everything it needs whether your bulking, cutting or just maintaining, Universal's Animal Pak has you covered. Each Animal Pak starts with mega-doses of necessary vitamins and minerals. Yeah, vitamins and minerals. Vitamins (organic) and minerals (inorganic) are pharmacological agents and catalysts. They can exert significant ergogenic/anabolic benefits and function as the spark plugs for activating all the necessary chemical reactions which make training and building muscle possible. Research has proven that strength athletes such as bodybuilders and powerlifters, due to the intensity and frequency of their training programs, have higher nutritional requirements than regular athletes. Studies have shown that these unique needs are greatly increased for bodybuilders who regularly compete and need to diet down. During calorie-restricted diets (diets which tend to be repetitive and monotonous, e.g., rice and chicken), the potential for nutritional deficiencies increase dramatically. More alarming is the fact that championship-caliber bodybuilders, even when supplementing with a regular multivitamin, were still experiencing significant nutritional deficiencies. A basic multivitamin supplement won't be enough. Competitive bodybuilders know that a superior multivitamin is the first line of defense. This fact is confirmed by studies which have revealed that 100% of Olympic weightlifters and over 90% of competitive male and female bodybuilders use a vitamin/mineral supplement like Animal Pak. These nutritional gaps not only affect your performance and size, but they begin to impact the way your other supplements work. For many of today's supplements to work efficiently, your body needs to be running on all cylinders. Nutritional gaps mean that your supplements may be rendered ineffective. For example, many supplements (e.g., prohormones) rely on enzymes and other substances in your body to "activate" them. Poor nutrition means poor conversion and activation of expensive supplements. Animal Pak is your insurance policy to prevent this from happening. One other reason to take Animal Pak daily: drug-induced nutrient depletion. Pharmaceutical drug use can lead to vitamin and mineral deficiencies. Relying on "science” or “gear” to get you huge can obviously exacerbate this problem. Even common pharmaceuticals and OTC's such as aspirin, ibuprofen, antidepressants, and cholesterol-lowering drugs can deplete your body of folic acid, iron, potassium, and important vitamins. If you use drugs of any kind, this is another reason to supplement with Animal Pak. With Animal Pak, you get plenty of everything you need. And a few extras. Animal Pak features performance optimizers such as pyridoxine alpha-ketoglutarate (PAK), carnitine, lipotropics, L-arginine, alpha lipoic acid, eleuthero, and the like. In every pack, you get a vast arsenal of over 60 key ingredients that are delivered in the right amounts at the right time, every time. Each of the 11 tablets included in each pak has been specifically formulated to deliver the goods. What Is Universal Nutrition Animal Pak Powder? Animal Pak Powder. The New Original. After more than three decades of dominance, we reintroduce a legend. Responding to the demands of some of the hardest training lifters on the planet, after months of testing and tweaking, we proudly present The NEW Original. All of the potent power of Animal Pak, in convenient powder form. That's Pak Powder. With Animal Pak Powder, you get plenty of everything you need. And a few extras. Animal Pak Powder features performance optimizers such as pyridoxine alpha-ketoglutarate (PAK), carnitine, lipotropics, L-arginine, alpha lipoic acid, eleuthero, and the like. In every scoop, you get a vast arsenal of over 60 key ingredients that are delivered in the right amounts at the right time, every time. Each of scoop of Animal Pak Powder has been specifically formulated to deliver the goods. What's in Universal Nutrition Animal Pak? Dosage: Take a single pack of Animal Pak with breakfast or any other meal, with plenty of water. For those who compete or are training with higher intensity, take two packs daily, separated by 4-12 hours. Made in a GMP facility that uses milk, soy, egg, peanuts. What's In Universal Nutrition Animal Pak Powder? How Do I Take Universal Nutrition Animal Pak Powder? Take 1 to 2 scoops of Animal Pak Powder with 6 – 12 oz of your beverage of choice with breakfast or any other meal. For those who compete or are training with higher intensity, two scoops of Animal Pak Powder is suggested. This product (Animal Pak Powder) is not for use by anyone under the age of 18. This is a potent bodybuilding supplement. Do not take this if you have or are at risk for any medical condition or disease. Please consult with a physician before using this product, especially if you are using any prescription drug, over-the-counter medication, or supplements. Immediately discontinue use if any side effects occur. Keep out of reach of children. Athletes should consult with their sanctioning authority before use. Do not exceed recommended dose. These statements have not been evaluated by the Food and Drug Administration. This product is not intended to diagnose, treat, cure, or prevent any disease. Long term intake of this amount of vitamin B6 may lead to mild tingling and numbness. This amount of calcium and phosphorous may cause mild upset stomach in sensitive individuals. Long term intake of this amount of zinc may lead to anemia. Don’t exceed two packs daily. This product not to be used as a substitute for a varied diet. Keep out of reach of children. O Animal Pak na minha opinião é um dos suplementos mais completos que existe no mercado! I liked it, because help me in my evolution muscle. I really love this supp, I run it whenever I can and its all but a staple in my cuboard...money keeps it from being a staple. There's alotta pills to take...but don't dispare! They pair up easy, and you can take em in 2s save for the Monster pills. You do notice a boost of energy from this, nothing major but more of an alert feeling. Which is great. You don't notice much else, cuz its not designed to do that. Its a vitamin...the best one mind you. What really floors you is what's in the pak. Reading the label can be daunting...but try. The Pak has everything you need...EVERYTHING. has amino acids, liver support, and yer standard vitamins all in large quantities. Obviously built for someone serious about performance. Could it be you? The price is OK. About $40 or so, but for 44 paks its about right. I'd gladly pay more, but I am a college student. I haven't doubled up the servings like it suggests, but I plan on doing so next time around. You just take one with a meal and one pre or post workout...can't remember which. Taking one a day makes it last longer, and is more than enough. But if you can try taking two a day. Took 1 pack a day and provided me with great energy level, good pumps in the gym, somewhat quicker recovery and helped with staying tighter. Great foundation for any diet and I would reccommend this product before anything else. Take this product as your foundation of vitamins and minerals and then stack other products such as creatine, glutamine, BCAA's ontop of that! 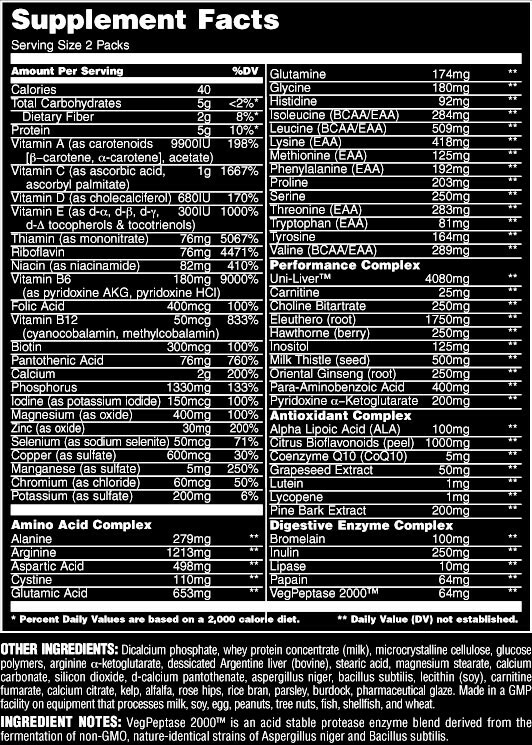 We have a large selection of in-stock UNIVERSAL NUTRITION products including Multi Vitamins items and others for the lowest prices at SameDaySupplements.com® It's always easy to shop for Animal Pak By Universal Nutrition at SameDaySupplements.com because you can browse by reviews, brand, prices or search for specific ingredients using our search tool. In-stock orders placed before 3pm EST ship out the same day to USA, Brazil, United Kingdom, Canada, Germany, Australia, Japan, India, France and worldwide at the cheapest prices online.